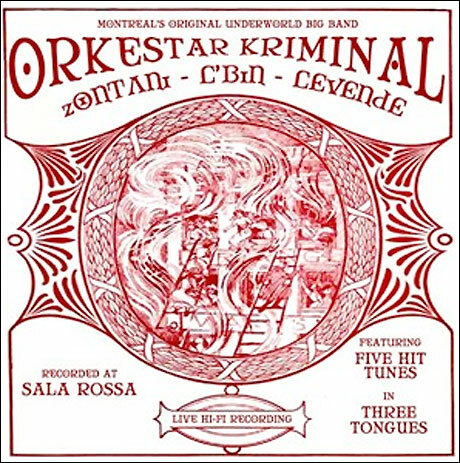 Multilingual Montreal ensemble Orkestar Kriminal specialize in cover tunes, although you're unlikely to be familiar with any of the material on the upcoming Zontani! L'bin! Levende!, which they will launch with a hometown show on March 22 at the Lion d'Or. Orkestar Kriminal, who are fronted by previous Hot Springs/Gigi French member Giselle Weber and feature members who played with the likes of CPC Gangbangs, Bloodshot Bill and the Handcuffs, and Clues, formed in 2012 with a unique world music cabaret style that includes horns, violin, accordion and variety of other instruments. Zontani! L'bin! Levende! translates as Live! Live! Live! in Greek, Yiddish and Danish, and each of those languages is represented on the EP, which was recorded live at Sala Rossa. Weber reportedly used Google Translate to help her pronounce the words in unfamiliar languages. These five songs consist of folk classics that were sung by gangsters and criminals in the '20s and '30s. According to a press release, "Zontani! L'bin! Levende! showcases Orkestar Kriminal's flair for the improv, extending old world melodies into the psychedelically playful." The bill for the show at the Lion d'Or also features Ira Lee and Gypsy Kumbia Orchestra. Orkestar Kriminal Announce New Album, Share "To Toust"